Surprise someone with a floral bouquet when they least expect it, or enjoy fresh flowers from your garden in any room of your home. This shatter-proof vase is large enough to hold a single stem arrangement, or a compact gathering of fresh clippings. It is equipped with a strong suction cup on the back side, so instead of placing it on a flat surface, you can attach it to any smooth and dry vertical one in your home, office or even RV. It works great to add fresh or dried flowers to a bathroom mirror, or fragrant roses to your kitchen window. Stick a Valentine arrangement to a file cabinet at work, or greet visitors with a small, inviting bouquet, right on the front door. The possibilities are endless with this simple, yet effective decoration device. The flexible vase is made from high quality vinyl so it will be lightweight to ensure a strong hold, yet sturdy enough to last through many uses. Thanks to the shape and clear coloring, it will give the look of glass without the bulk or possibility of breakage. If you would prefer a glass vase with suction cup, we also carry one of those. It is not as big as this one, but some people may prefer the material or styling. The flexible, plastic material that this one is made from will store flat when not in use, but then expand to allow for whatever amount of flowers you decide to add. It can easily remain stable when suspended, because the pliable exterior will sit flush against the flat surface you stick it to. Of course if it falls due to accident, or is dropped while being transported, you run no risk of damage, just spilled water, and strewn flowers. While stuck in place, the strong hold will remain secure until well after the flowers have withered, so you will decide when it comes down, not gravity. This product is similar to the Single Bulb version in overall size, but that one has a wider body to allow for more dense arrangements. For a smaller one, check out the Mini Oval, and for one that is bigger, look at the Trumpet Shape or Three Blossom versions. Using one of these Single Stem Window Vases is incredibly simple. It will offer an easy way to display flowers in unusual or convenient places. Using one is not tricky, but follow these steps for guaranteed results. It is important to ensure that the area where you intend to hang the vase is a good fit. Textured walls and other uneven, or not quite smooth surfaces will not allow the suction cup to maintain a strong bond. Areas made of glass, metal and other smooth materials will be your best bet. Once you find an ideal location, you will want to clean it and then let it dry thoroughly. If the surface is dirty, you could also have trouble getting the vase to stick, and after cleaning, if the area remains moist, you could have a problem with sliding that would be avoided once dry. After the surface is ready, simply add your desired flowers to the vase, and then add water. Once full, simply stick the suction cup in the location you have prepared and apply firm direct pressure to lock it in place. Surprise a loved one, enjoy the fruits of your labor, or make your home smell better by utilizing natures natural odor eliminators. This handy flower vase can help you to beautify your home, deliver a special message to a loved one, or just allow you to display garden clippings, as they bloom, all season long. Attach to a grave stone to leave behind flowers that will stay fresh longer, or say I love you when she least expects it. With so many locations and occasions that are perfect for this product, you will be surprised at what you come up with. Order Yours Today! Where to Use Sticks to clean, dry surface that is smooth. Works great on windows and mirrors. Also ideal for metal surfaces, tile, polished stone etc. 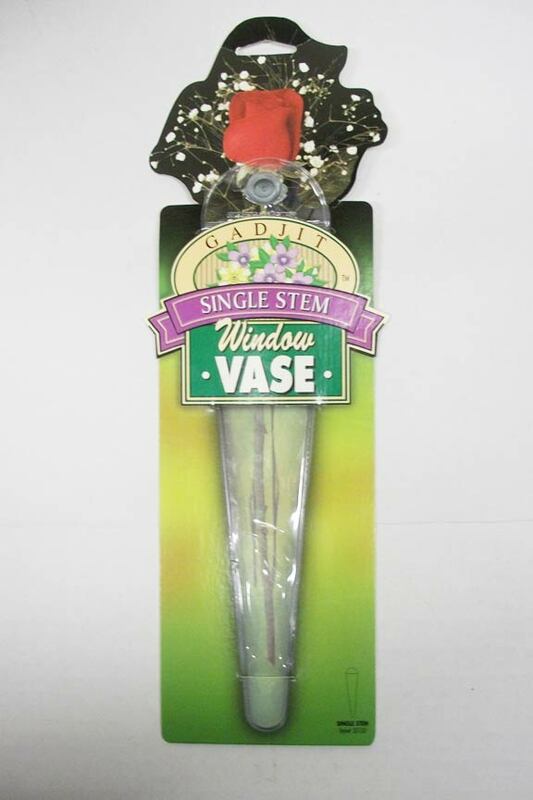 Single Stem Window Vase - Enjoy fresh flowers in any room of your home or office, no matter how much space you have. A strong suction cup will allow you to stick this vase almost anywhere! Order Yours Today! I was disappointed when I opened the package and saw that they looked plastic, but when I hung them on the window they looked fabulous! They looked like glass and the length allowed for a longer stem so it wouldn't fall out.